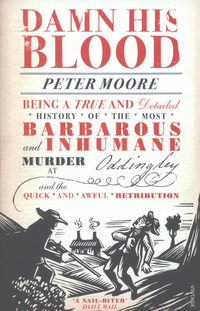 Damn his blood by Peter Moore. We want to read this book as sounds a bit like the suspicions of Mr. Whicher, which was very enjoyable. It’s on order for libraries, coming very soon. It is Peter Moore’s first book and he is a young author. Damn his blood: being a true and detailed history of the most barbarous and inhumane murder at Oddingley and the quick and awful retribution. This entry was posted in Book Reviews and tagged Authors, Book Reviews, Crime. Bookmark the permalink.